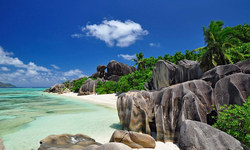 Anse Source D'argent is by far the most renowned beach on La Digue Island, popular for for its pink granite rocks, large lagoons and extraordinary sunsets. 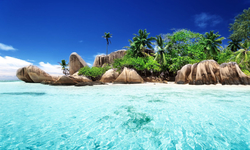 This beach is a spectacular location for everyone especially tourists visiting the Seychelles, definitely a must see when staying on La Digue. 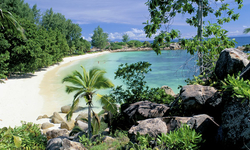 Grand Anse Beach is one amongst the beautiful beaches on La Digue Island. 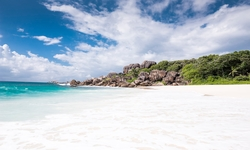 This fascinating beach is bordered by large granite rocks and quite huge waves which therefore people are advised not to go for a swim in there. 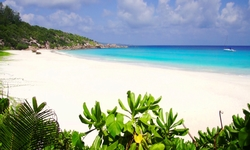 But the scenery there is definitely appealing for photographs or just for the sake of seeing the beach. 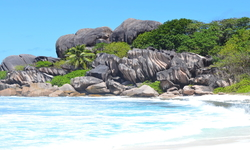 Petite Anse is similar to Grand Anse with less waves and accessible by a small rocky path from the latter. The waters blue is even more intense, and the people here are even less numerous. 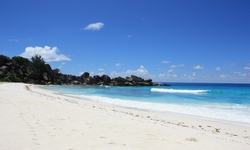 - Anse Coco: Even quieter in all respects, its sides are ideal for snorkelling (lots of coral fish and turtles). 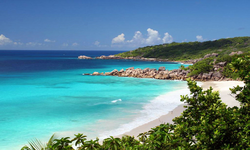 - Anse Severe: Just before reaching the northern point of La Digue, you will meet this long, sandy, stunning beach. Ideal for those who enjoy calm, shallow waters and shade from the sun. 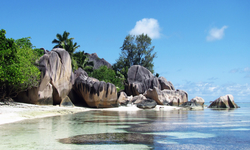 - Anse Patate: Just past the point, is a small creek of white sand encircled by stunning granite cliffs that offer a spectacular breaking surface for the incoming waves. It is a good starting point to do snorkelling past the reef.